I've waited a long time for Samsung to release a smartphone that runs Microsoft’s Windows Phone 8 operating system. I found WP8 appealing, but the Nokia hardware where it's most commonly available failed to impress. The Nokia Lumia 920 in particular was heavy, it ran hot, and you couldn’t swap out its battery, which drained at a ridiculous pace. I find it reassuring that I can pop in a fresh spare battery whenever the need arises. There was a Samsung ATIV S—a Galaxy S3 running Windows Phone 7—which saw wide release everywhere but in the U.S. And in late 2013 Sprint and AT&T got the ATIV S Neo, which was a step down in hardware from what Nokia was offering at the time. Now Samsung is shipping the ATIV SE. It’s not a Galaxy S4 running WP8, but it’s close. This is the phone I’ve wanted for a very long time. 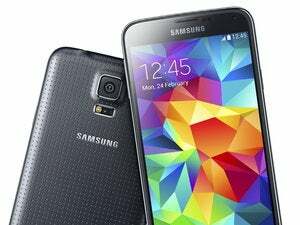 Aside from its user interface, Samsung's Galaxy ATIV SE is easy to mistake for for the Galaxy S4. 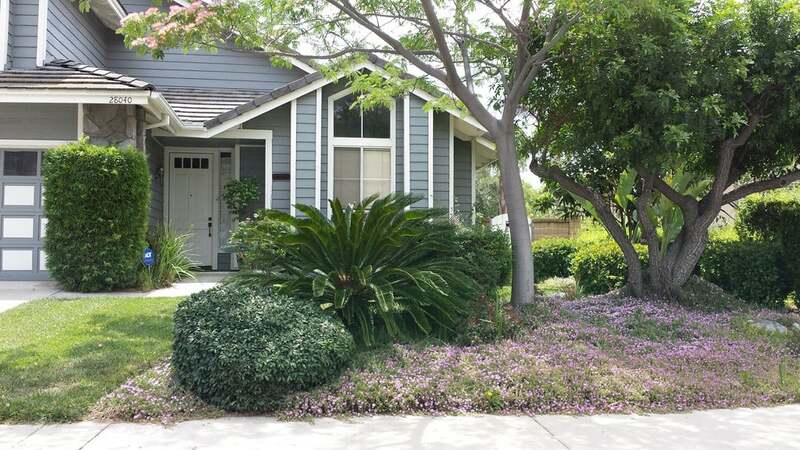 I live in Orange County, California: iPhone country. It seems everyone has an iPhone here. Androids are exceptionally rare. But a few people have seen me using the ATIV SE, cocked their head to one side, and asked "Is that a Galaxy S4?" Not exactly, I say. Their misperception is understandable. 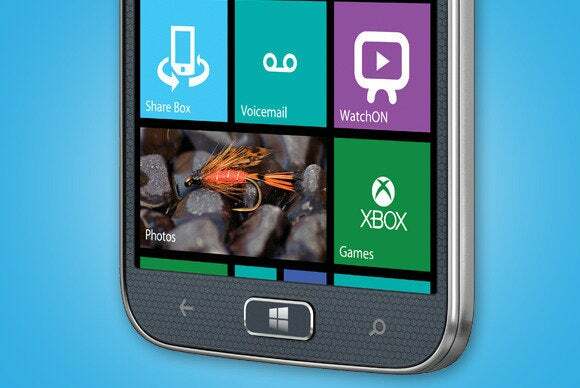 The ATIV SE looks a lot like a Galaxy S4, it just runs Windows instead of Android. The ATIV SE is available only from Verizon, but it wasn’t on display at the brick-and-mortar store I visited. I had to special-order one. The Galaxy S4, by contrast, is available on six carrier networks: AT&T, T-Mobile, Sprint, Cricket, and U.S. Cellular in addition to Verizon. Measuring 5.42 by 2.75 by 0.33 inches, the ATIV SE is a fraction of an inch longer than the S4, which leads to my single biggest complaint: None of the myriad cases designed for the S4—including the Mophie Juice Pack— fit the ATIV SE. That was an enormous disappointment. The way I see it, if Mophie won't make a Juice Pack for iPhone 5c, they’ll never make one for the ATIV SE. I did find a few ATIV SE cases for sale on Amazon, but there's no good reason why Samsung had to change the case dimensions by such a tiny amount, so that Galaxy S4 cases won't fit it. The ATIV SE has the same gorgeous screen as the S4: A 5-inch AMOLED capacitive touchscreen made from Corning Gorilla Glass 3 and capable of displaying 16 million colors. The 1920x1080 resolution results in pixel density of around 441ppi . In that regard, it's identical to the S4. The Lumia Icon has 32GB of storage to the ATIV SE’s 16GB, but Samsung’s phone has a MicroSD card slot where Nokia’s does not. It weighs less: 4.8 ounces for the ATIV SE compared to 5.9 ounces for the Icon. The ATIV SE has a beefier battery, too: 2600mAh, compared to the Nokia’s 2420mAh. And the battery in the Samsung phone can be removed and replaced. Samsung’s Galaxy S4, meanwhile, uses Samsung’s own Exynos Octa 5410 SoC, along with a PowerVR SGX544MP3 GPU. The Exyonos Octa 5410 pairs an 1.6GHz, quad-core ARM Cortex-A15 with a 1.2GHz quad-core ARM Cortex-A7. But four plus four doesn’t add up to an eight-core CPU, because only four cores are active at any one time. ARM’s big.LITTLE architecture activates whichever CPU can perform the task at hand most efficiently, in order to preserve battery life. These Canvasmark scores indicate that Qualcomm's Snapdragon 800 SoC has a stronger GPU than Samsung's own Exyonos Octa 5410. 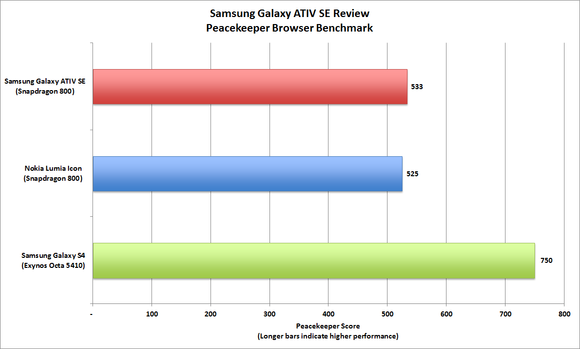 The Android phone has a much higher Peacekeeper scores because it uses Chrome, where the Windows Phone 8 devices rely on Internet Explorer. 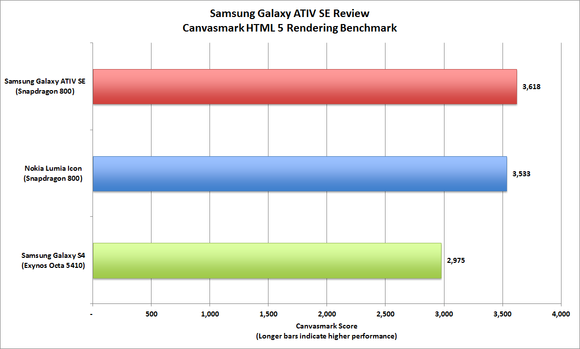 The S4 beats both Android phones in the rest of the benchmarks, although the differences in AnTuTu scores are relatively negligible. These Peacemaker browser benchmark results, meanwhile, highlight the inferiority of Internet Explorer compared to the Chrome browser. Both the Galaxy S4 and the ATIV SE feature a 13-megapixel auto-focus camera with resolution of 4128x3096 pixels, but the S4’s camera has a few features the ATIV SE’s does not, including dual-shot mode (shooting with both the front and rear cameras at the same time), simultaneous HD video and image recording, face and smile detection, and image stabilization. The ATIV SE also lacks a physical button for snapping photos. 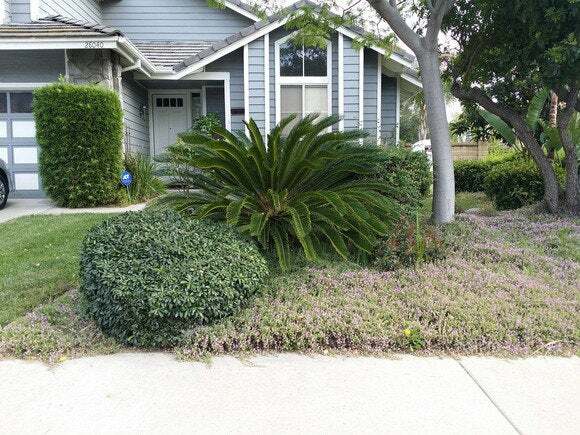 As you can see from these photos, however, the two cameras are pretty much even in terms of picture quality. The first photo below was taken with a ATIV SE, and the second shot was snapped with a Galaxy S4. I took this photo with the Samsung Galaxy ATIV SE (click to enlarge). This version was taken with the Samsung Galaxy S4 (click to enlarge). You’ll use Windows Phone app for desktop to manage your pictures, videos and music (there’s a version for the Mac, too). The app syncs your phone’s media to your PC’s. In terms of day-to-day use, I found the ATIV SE to be as responsive as the Nokia phones I've used. It responds instantly to all input; if anything, the screen is too sensitive and too easily activated. I've nearly deleted tiles just by putting the phone in my pocket. Its reliance on Internet Explorer for web browsing, however, is easily its weakest link. The browser doesn’t automatically open links in new tabs (you must long-press the link and then tap a menu option). But that’s a limitation of Windows Phone 8, not Samsung’s hardware. Battery life is superb. I've yet to run it below 80 percent, even while gaming during lunch. And I like knowing that I can swap out its battery if I do exhaust it when there’s no AC outlet in sight. Just like the Lumia phones, however, the ATIV SE suffers from an odd quirk that prevents it from shutting down while it’s plugged into power. It will restart, but it won’t turn off. The ATIV SE offers HSDPA LTE download speeds up to 42.2 Mbps and HSUPA uploads of 5.76 Mbps. Its feature set is typical of this class and includes Bluetooth 4.0, 802.11b/g/n on the 2.4GHz frequency band and 802.11a/ac on the 5GHz band. The phone also supports DLNA and Wi-Fi Direct, and it can be configured to provide a Wi-Fi hotspot. Aside from its camera and size, most of my reservations about the ATIV SE are related to Windows Phone 8, not the hardware the OS is running on. It’s lighter than the Lumia Icon, it offers expandable storage via a MicroSD slot, and you can swap out its battery. The change in chassis dimensions compared to the Galaxy S4, on the other hand, is borderline unforgivable—I can't imagine what Samsung's engineers were thinking. I also must question Samsung's dedication to this phone, considering that it’s available only by special order on a single carrier. 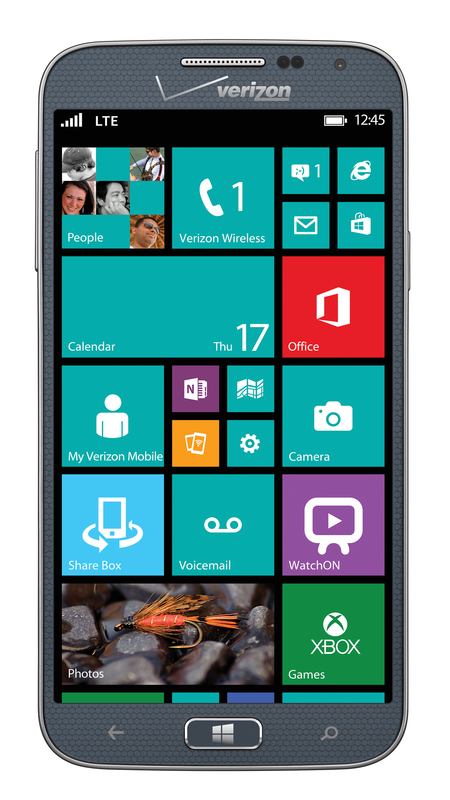 Having said all that, I must also say that Samsung’s ATIV SE is the best Windows phone so far. Update: This story was updated to correct the name of the phone (it's not marketed as part of Samsung's Galaxy lineup) and to clarify the availability of the ATIV S and how Internet Explorer operates in Windows Phone 8. It’s everything that Nokia's Lumia Icon is, but in a lighter package.